Family days out with hot air balloon rides in Plymouth! It can be a nightmare trying to find an activity the whole family can be part of without spending enormous amounts of money, but with these Groupon vouchers for hot air balloon rides in Plymouth your family could be floating sky high while the cost is hitting rock bottom! The experience of seeing Plymouth during hot air balloon rides is one your children will never forget, and with the sort of discount these vouchers offer, there's no excuse not to take advantage of our magnificent leisure offers deals! Take the whole family out, and treat them to hot air balloon rides in Plymouth with our fantastic vouchers! Amazing vouchers for hot air balloon rides in Plymouth! See the city and coastline from a whole different perspective while enjoying hot air balloon rides far above Plymouth with these outstandingly good value vouchers! It most definitely is the experience of a lifetime to see the coastline from far above Plymouth on hot air balloon rides, so make the most of these leisure offers from Groupon and treat yourself to a day to remember! 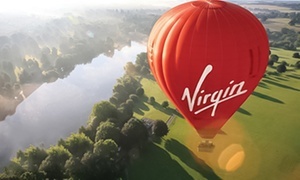 Be quick though, the discounts these vouchers offer means they are sure to sell out quickly, so buy your hot air balloon rides in Plymouth while you still can!